This hotel has it all. 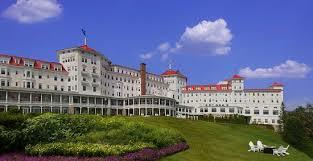 Breathtaking in its decor but also nestled in panoramic views of NH. Enjoy ALL the amenities of the hotel! Pool, hot tubs, gym, and grounds. Restaurants, and an underground Speakeasy Lounge. Spa facilities and shops are also a must!! Spiritual well being and Paranormal Expo!! Workshops & mini lectures will be held during the day event!! A full line up will post soon with all details. Paranormal Evening with the famous Princess!!! There are a variety of rooms to accommodate groups of 3 or 4 attending together. ESample Itinerary..Full details to post soon!! Check in is at 4:00 ( earlier if room is available) guests are welcome to go to the hotel early and spend the day exploring! As grand as the history behind it, Omni Mount Washington Resort, located in Bretton Woods, New Hampshire, is gracious in ambiance and generous in amenities. A favorite New England retreat of presidents, poets and celebrities, the hotel delights every sense with enchanting music, refined dining and luxurious décor. The resort boasts a classic Donald Ross-designed golf course, award-winning alpine and Nordic ski center, luxurious signature spa, decadent dining facilities and nine high-flying zip-lines. After exploring, unwind in luxurious guest room accommodations. A grand masterpiece of Spanish Renaissance architecture, the resort was a two-year labor of love for 250 master craftsmen. Conceived by industrialist Joseph Stickney, this National Historic Landmark opened in 1902 and has been attracting generations of families ever since. of inspiration, wisdom, and healing. I really began my deep inner quest when I started my magazine; The Mirror Magazine, which encompasses the overall conceptual belief that I have; we are all connected. I am a spirit writer and my writings reflect the messages that spirit brings through me. While writing has always been my passion, understanding all the different aspects of my abilities was what motivated me to begin the journey of mediumship. I will create a Facebook private group of guests who are attending the event. This is where I will share itinerary and detailed information as the event draws closer. If you do not have a facebook account please let me know and I can email you the information. As for tickets, I will have your name on a guest list of attending. I would also suggest to bring your PayPal receipt with you. All event tickets once purchased are non-refundable or transferable to another event for any circumstances. I understand life happens, however, I have to pay for your spot regardless. I price my events as reasonable as I can make them. There are no refunds. If the event is rescheduled due to unforeseen circumstances, a new date will be rescheduled. If you are unable to attend the new scheduled date, you may use your ticket value towards other events or services by Karen Tatro. There are no refunds.